Upon returning to the United States, Vietnam veteran John Rambo has difficulty adjusting to civilian life and wanders the country as a drifter for almost a decade. In December 1981, Rambo travels to the fictional town of Hope, Washington, in search of a U.S. Army Special Forces buddy named Delmore Barry. Rambo arrives at Delmore's supposed residence and finds Delmore's little daughter and his depressed widow. Delmore's widow tells Rambo that her husband died from cancer the previous summer due to exposure to Agent Orange, and that she must seek out a living as a cleaning lady and on Delmore's Service member's Group Life Insurance. Rambo, attempting some cold comfort, gives Mrs. Barry the photograph of Delmore's unit. He is left with a mild sense of survivor's guilt as he is now the last man still living of his once-proud unit (known in the Army Special Forces as Operational Detachment Alpha or "A" teams). He then travels to Hope in the attempt to find a diner and maybe a temporary job. The overconfident town sheriff Will Teasle (Brian Dennehy), does not welcome Rambo, judging the military hero negatively because of his long hair and scruffy look. Rambo disobeys the sheriff's order to stay away from Hope, as he has done nothing wrong to the community and he believes such banishment to be a violation of his freedom of movement, and is promptly charged for vagrancy and subject to harassment from the deputies, who spray him with a hose, beat him, and try to shave his beard while he is held down. The harassment triggers flashbacks of Rambo's traumatic memories of his torture at the hands of the North Vietnamese when he was a prisoner of war, and his mind regresses into thinking he is once again fighting in combat. Rambo fights his way out of the sheriff's department with his bare hands and makes his way into the wilderness on a stolen motorcycle. A manhunt ensues. The sheriff and his deputies cannot win against Rambo in the forest, and indeed, all are badly wounded as a result of trying to capture him. Rambo deals with them efficiently and although capable of doing so, he doesn't kill any of them. He does unintentionally kill a police officer in self-defense by throwing a rock at a helicopter, causing the pilot to lose control and an officer to fall out. The Washington State Patrol and about 200 members of the Washington Army National Guard are called in to assist. At this point, Colonel Samuel Trautman (Richard Crenna), the former commanding officer of Rambo's old Special Forces unit, arrives in Hope. Trautman warns that continuing the manhunt is dangerous to the authorities, as Rambo is too experienced to be captured easily in the wilderness where he thrives. He instead suggests giving Rambo a chance to escape; if Rambo is allowed to slip away, he'll be given time to calm down and he can be arrested without incident. The authorities reject Trautman's recommendation and continue the manhunt, and Rambo's subsequent rampage culminates in the destruction of the sheriff's office and more of the town's main street. 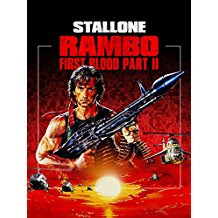 Rambo stands poised to eliminate the sheriff, but Trautman finally confronts Rambo face-to-face, and ultimately convinces his former soldier to surrender to the authorities. Between the first and second films, Rambo is convicted and remanded to a civilian maximum-security prison where heavy duty labor is the norm. Despite being a convict, the rigid routine and discipline of prison life provides Rambo with some measure of much-needed stability, as it reminds him of his past in the military and its own rigid hierarchy. In the second installment of the series in 1985, Trautman offers Rambo his freedom if Rambo will return to Vietnam to search for American prisoners of war remaining in Vietnamese captivity. Marshall Murdock (Charles Napier), the official in charge of the mission, is portrayed as a corrupt political figure who doesn't want to expose the truth. Rambo is not to engage the enemy and instead is ordered to take photographs of a North Vietnamese military base to prove to the American public there are no more POWs (prisoners of war) in Vietnam, although Murdock knows that there are. Rambo is sent to a part of the jungle where Murdock receives confirmation that no POWs were being held at the time. Rambo works with anti-communist Vietnamese female rebel Co Bao (Julia Nickson), who is serving as an intelligence agent. Rambo discovers that there is a POW camp where he was dropped; POWs are rotated between camps, and coincidentally are nearby when he was dropped. Rambo breaks one POW out of the camp and attempts to escape, only to be refused access to the base by Murdock and to have himself and the POW recaptured by the Vietnamese soldiers. Rambo is immobilized in a pit of sewage and leeches, then tortured by Soviet soldiers, who are allied with the Vietnamese and training Vietnamese soldiers. Co enters the base under the guise of a prostitute for hire, where she aids Rambo in escaping. After Rambo expresses his deepest gratitude for his rescue, the two share a kiss, after Co implores him to take her back to America with him. As they prepare to move on, Co is shot down by surprise gunfire. Enraged, Rambo then acts on his own initiative and starts a one-man rescue mission, stealing a Soviet helicopter and breaking all the POWs out of captivity. After returning to the US base in Thailand with all the POWs, Rambo becomes enraged at how the United States government has ignored the existence of surviving soldiers being held captive. 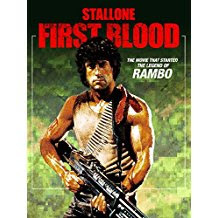 Rambo then threatens Murdock and tells him to be forthright with the American public regarding the truth of the POWs and to spare no expense in rescuing them all, or else he will return for Murdock. When Trautman says Rambo will be honored once again, he declines, saying the POWs deserve the accolades more. For his actions in Vietnam, Rambo is granted a presidential pardon and decides to remain in Thailand. Between the second and third films, Rambo takes up residence near a monastery where he engages in frequent meditation to find a sense of inner peace. 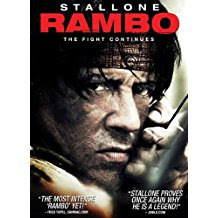 Although Rambo believes his soldiering days are apparently over, he does not become a complete pacifist, as he often participates in violent stick fighting matches and donates his winnings to the monks to help renovate the monastery. The film opens with Colonel Samuel Trautman (Richard Crenna) returning to Thailand to once again enlist Rambo's help. After witnessing Rambo's victory in a stick fighting match, Trautman visits the temple Rambo is helping to build and asks Rambo to join him on a mission to Afghanistan. This brings Rambo more into the realm of the CIA's famed Special Activities Division which primarily hires Army Special Forces soldiers. The mission is meant to supply weapons, including FIM-92 Stinger missiles, to Afghan freedom fighters, the Mujahideen, who are fighting the Soviets. Despite having been shown photos of civilians suffering under the Soviet rule, Rambo refuses and Trautman chooses to go on his own. While in Afghanistan, Trautman's troops are ambushed by Soviet troops while passing through the mountains at night. Trautman is imprisoned in a Soviet base and tortured for information by commanding officer Zaysen (Marc de Jonge) and his henchman Kourov (Randy Raney). Rambo learns of the incident from embassy field officer Robert Griggs (Kurtwood Smith) and immediately flies to Pakistan where he meets up with Mousa (Sasson Gabai), a weapons supplier who agrees to take him to a village deep in the Afghan desert, close to the Soviet base where Trautman is kept. The Mujahideen in the village are already hesitant to help Rambo in the first place, but are convinced not to help him when their village is attacked by Soviet helicopters after one of Mousa's shop assistants informed the Russians of Rambo's presence. 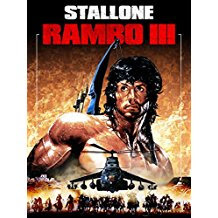 Aided only by Mousa and a young boy named Hamid (Doudi Shoua), Rambo makes his way to the Soviet base and starts his attempts to free Trautman. The first attempt is unsuccessful and results in Hamid getting shot in the leg, and Rambo himself getting hit by wooden shrapnel. After escaping from the base, Rambo tends to Hamid's wounds and sends him and Mousa away to safety. The next day, Rambo returns to the base once again, just in time to rescue Trautman from being tortured with a flamethrower. After rescuing several other prisoners, Rambo steals a helicopter and escapes from the base. The helicopter crashes and Rambo and Trautman are forced to continue on foot. After a confrontation in a cave, where Rambo and Trautman kill several Russian soldiers including Kourov, they are confronted by an entire army of Russian tanks, headed by Zaysen. Just as they are about to be overwhelmed by the might of the Soviet Army, the Mujahideen warriors, together with Mousa and Hamid, ride onto the battlefield in a cavalry charge, overwhelming the Russians despite their numerical and technological superiority. In the ensuing battle, in which both Trautman and Rambo are wounded, Rambo manages to kill Zaysen by driving a tank into the helicopter in which Zaysen is flying. At the end of the battle Rambo and Trautman say goodbye to their Mujahideen friends, and leave Afghanistan to go home. The film opens with news footage of the crisis in Burma. Burma (also known as Myanmar) is under the iron fist rule of Than Shwe and takes harsher stances against the nation's pro-democracy movement. Rebels are thrown into a mine-infested marsh and then gunned down by a Burmese army unit, overseen by Major Pa Tee Tint. Former U.S. soldier John Rambo still lives in Thailand, now residing in a village near the Burmese border and makes a living capturing snakes and selling them in a nearby village. A missionary, Michael Burnett (Paul Schulze), asks Rambo to take him and his associates down the Salween River to Burma on a humanitarian mission to help the Karen people. Rambo initially refuses but is convinced by another missionary in the group, Sarah Miller (Julie Benz), to take them. The boat is stopped by pirates who demand Sarah in exchange for passage. After taking advantage of the pirates' complacency, Rambo kills them all. Although his actions save the missionaries, it greatly disturbs them. Upon arrival, Michael says that they will travel by road and will not need Rambo's help for the return trip. The mission goes well until the Burmese army, led by Major Tint, attacks the village, killing most of the villagers and two missionaries, and capturing the rest. When the missionaries fail to come back after ten days, their pastor, Arthur Marsh (Ken Howard), comes to Rambo to ask for his help in guiding hired mercenaries to the village where the missionaries were last seen. Troubled by Sarah's potential fate, Rambo decides to accompany the soldiers. After seeing the destroyed village filled with mutilated humans and animals, Rambo encourages the team to move on. Hijacking a truck, they create a plan to save the hostages at the P.O.W. camp, doing so within fifteen minutes to avoid alerting the army. Rambo helps Sarah and the others to escape. The Burmese Army (Tatmadaw) unit finds their hostages missing and organizes a massive manhunt. Everyone except for Rambo, Sarah, and "School Boy", the mercenary team's sniper, is captured. Just as the group is to be executed, Rambo hijacks a truck-mounted .50-caliber machine gun and engages the Burmese army. A group of Karen rebels joins the fight to help Rambo and the mercenaries defeat the Burmese unit. Seeing that the battle is lost, Major Tint decides to flee, only to run into Rambo's machete, which Rambo then uses to disembowel the Major. Encouraged by Sarah's words, Rambo returns to the United States. The last scene shows him walking along a rural highway, past a horse farm and a rusted mailbox with the name "R. Rambo" on it. He makes his way down the gravel driveway as the credits roll.